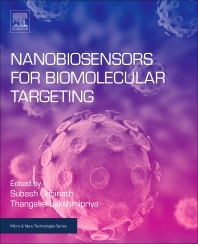 Nanobiosensors for Bio-molecular Targeting presents the latest analytical methods for the detection of different substances in the range of small molecules to whole cells, exploring the advantages and disadvantages of each method. Biosensors combine the component of biological origin and physicochemical detector to show the presence of analytes in a given sample. The use of bionanotechnology has led to a significant advancement in the progression of nanobiosensors and has been effectively used for biomedical diagnosis. Subash C.B. Gopinath is Associate Professor at the Institute of Nano Electronic Engineering & School of Bioprocess Engineering at University of Malaya’. His research focuses on biosensors, aptamer technology and diagnosis of infectious.